To Cite: Hirota M. Parenchyma-Sparing Pancreatectomy for Benign Pancreatic Neoplasms, J Minim Invasive Surg Sci. 2013 ; 2(4):-. Context: The current literature suggests that minimally invasive surgery is associated with faster recovery and less morbidity than open surgery. Parenchyma-sparing pancreatectomy is minimally invasive surgery, including enucleation, inferior head pancreatectomy, spleen-preserving distal pancreatectomy, and central pancreatectomy, combined pancreatectomy such as inferior head pancreatectomy plus spleen-preserving distal pancreatectomy, and subtotal distal pancreatectomy (spleen-preserving). Evidence Acquisition: Parenchyma-sparing pancreatic resection is mainly used for benign neoplasms, including intraductal papillary mucinous neoplasm (IPMN), mucinous cystadenoma, serous cystadenoma, and small sized neuroendocrine tumors including insulinoma. Results: Parenchyma-sparing pancreatectomy can be applied for benign pancreatic lesions. Assistance with pancreatic stenting and/or laparoscopy is recommended in some cases to prevent from complications. Conclusions: Recent advancements of surgical techniques have allowed us to perform several types of parenchyma-sparing pancreatic resection. The current literature suggests that minimally invasive surgery is associated with faster recovery and less morbidity than open surgery. Parenchyma-sparing pancreatectomy belongs to minimally invasive surgery. Minimally invasive pancreatectomy includes enucleation, inferior head resection ( 1 , 2 ), spleen-preserving distal pancreatectomy, central pancreatectomy, and combined pancreatectomy such as inferior head resection plus spleen-preserving distal pancreatectomy (Figure 1). Recent advancements of surgical techniques have allowed us to perform several types of parenchyma-sparing pancreatic resection. Parenchyma-sparing pancreatic resection is mainly used for benign neoplasms, including branch duct type of intraductal papillary mucinous neoplasm (IPMN), mucinous cystadenoma, serous cystadenoma, and small-sized neuroendocrine tumor including insulinoma. Such techniques are introduced and the associated discussion is reviewed in this manuscript. 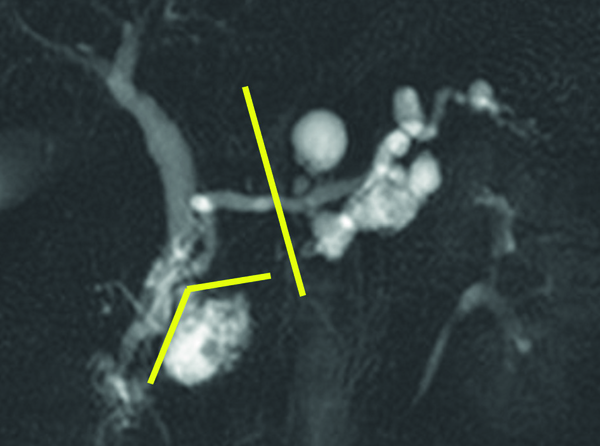 Branch duct type of IPMN often develops in the inferior head region of the pancreas. Such benign lesion can be managed by inferior head pancreatectomy (Figure 1a). Although local pancreatic resection such as inferior head pancreatectomy maintains the advantage of preserving pancreatic parenchyma, post-operative pancreatic fistula (POPF) can be developed ( 3 , 4 ). Sugiyama et al. reported a patient in whom preoperative endoscopic pancreatic stenting prevented the development of POPF following local resection of the pancreatic body tumor ( 1 ). Also, Hirota et al. reported the efficacy of preoperative endoscopic pancreatic stenting for preventing POPF formation after local resections in the pancreatic head region including inferior head pancreatectomy ( 2 ). Taken together, these reports suggest that preoperative endoscopic pancreatic stenting may be an effective prophylactic against POPF development after inferior head pancreatectomy. Patients can undergo prophylactic preoperative endoscopic transpapillary pancreatic stenting to prevent the formation of POPF. A few to seven days prior to surgery, each patient underwent placement of an endoscopic transpapillary pancreatic stent. During inferior head pancreatectomy, injury to the main pancreatic duct (in addition to the side branch ducts) increases the risk of pancreatic fistula formation. Pancreatic stenting is useful to prevent POPF development. Observations during endoscopic treatment of pancreatic fistula also demonstrate that a pancreatic stent allows the resection plane to seal by decompression of the pancreatic duct ( 5 - 10 ). In addition to reducing pancreatic juice leakage from the resection plane, preoperative endoscopic transpapillary pancreatic stenting also prevents injury to the main pancreatic duct in two ways: First, the anatomy of the main pancreatic duct is clarified by palpating the stent, and/or by viewing its color. Intraoperative ultrasonography and pancreatography are also available. Second, the installed stent can prevent dislocation of the main pancreatic duct during tumor retraction. Many surgical procedures, including duodenum-preserving pancreatic head resection (DPPHR) (11,12), dorsal/ventral pancreatectomy (13), resection of the lower portion of the head of the pancreas (14), and single-branch resection (15), have been devised for the clinical treatment of such benign or low-grade malignant lesions of the pancreas. POPF continues to be the most troublesome and sometimes lethal complication following partial resection of the pancreas. Preoperative endoscopic pancreatic stenting in selected patients may be an effective prophylactic to prevent refractory POPF formation following inferior head pancreatectomy. In benign cases, such as insulinoma, branch type IPMN, spleen-preserving pancreatectomy (Figure 1b) is performed. A total of the two trocars are then placed. After abdominal access is established, the gastrocolic omentum is divided, and the splenic flexure is mobilized. The short gastric and left gastroepiploic vessels are not divided to prevent splenic volvulus after the operation. Retrosplenic Gerota’s fascia is transected on the surface of the left kidney. Then, the posterior plane of Gerota’s fascia is dissected from lateral to medial direction, allowing the distal pancreas and spleen detached from retroperitoneum. The distal pancreas, spleen, and left side of stomach are then pulled out of the peritoneal cavity through the minilaparotomy for hand assistance at the epigastrium. 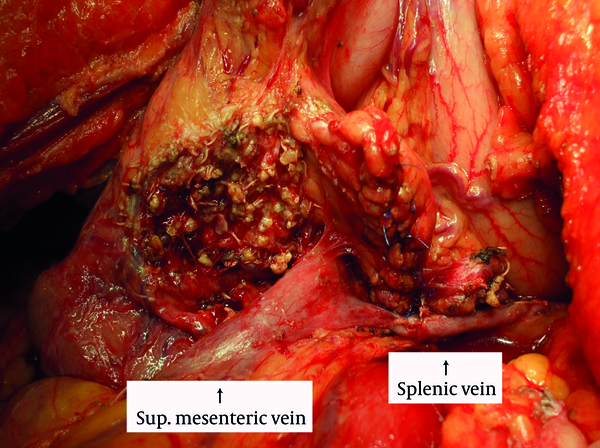 Spleen and gastrosplenic ligament preserving pancreatectomy is performed under direct vision. The advantage of extracorporeal procedure is the safety and certainty in dissection of the splenic vessels and preparation of the pancreatic stump. The transected main pancreatic duct is doubly ligated, and the transected pancreatic stump is sewn manually. The preserved spleen, stomach and splenic vessels are placed back in the peritoneal cavity after resection. Distal pancreatectomy with preservation of the spleen was first reported in 1988 (16). The advantage of preserving the spleen is obvious; it reduces the risk of postoperative severe inflammation and peripheral blood count aberration. Preserving the spleen has been a major procedure in distal pancreatectomy. Warshow reported a case of splenic abscess that occurred after sacrificing the splenic artery and vein (16). 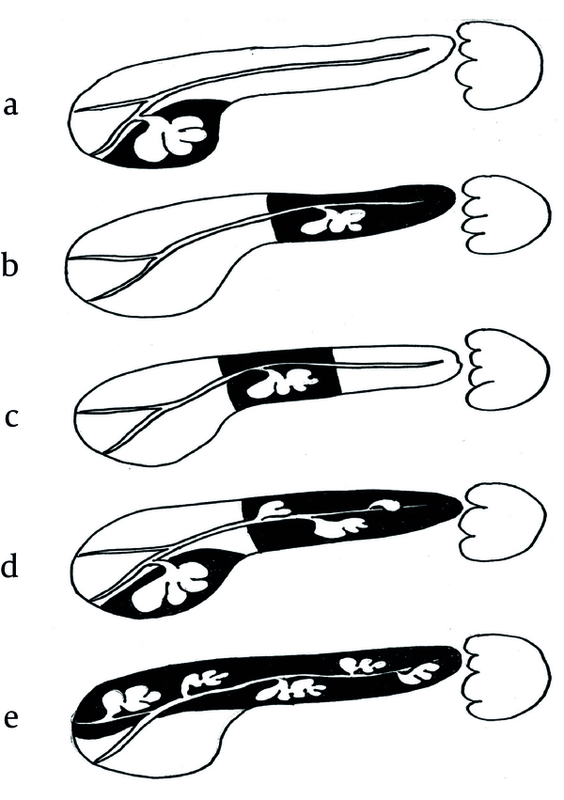 Kimura et al. reported five patients successfully treated with splenic vessel-preserving distal pancreatectomy to maintain the blood supply to the spleen and to avoid splenic necrosis and abscess ( 1 , 18). Spleen-preserving pancreatectomy has recently been shown to have comparable risk of complications to standard pancreatectomy where the spleen is removed ( 1 , 20). Nevertheless, spleen-preserving pancreatectomy remains an uncommon and technically demanding operation, due to the difficulty of dissecting the distal pancreas from the splenic vessels.As a modification of hand-assisted laparoscopic pancreatectomy, we devised a method of spleen and gastrosplenic ligament preserving distal pancreatectomy, in which pancreatic resection is performed under direct vision extracorporeally (21). One of the advantages of our procedure is the safety of dissecting the distal pancreas from the splenic vessels, because we can perform the dissecting procedure under direct vision. On the other hand, if the spleen is preserved, the spleen is often free in the abdomen, where it is prone to torsion or trauma. Another advantage of our spleen-preserving distal pancreatectomy is that torsion of the spleen can be prevented by preserving the gastrosplenic ligament (21). In low-grade malignant cases, such as mucinous cystic neoplasm, solid pseudopapillary neoplasm, medium-sized neuroendocrine neoplasm, the procedure is almost the same as in benign cases except the resection of the spleen and splenic vessels for lymph node dissection. The distal pancreas and spleen are pulled out of the peritoneal cavity through the minilaparotomy at the epigastrium. Pancreatic resection and closure of the residual pancreatic stump is performed safely under direct vision extracorporeally. Central pancreatectomy (Figure 1c) is also a parenchyma-sparing pancreatic resection for benign neoplasms located in the pancreatic body (22, 23). After exposure of neck to body of the pancreas, central pancreatectomy is performed by proximal and distal transaction. The distal portion is reconstructed by pancreatico-jejunostomy in Roux-en-Y style. This procedure is low-invasive and allow the preservation of exocrine and endocrine pancreatic function without loss of duodenal passage, however, it also has a high morbidity associated with pancreatic fistula. Invasive ductal carcinoma, even when the tumor is small enough, is not eligible because the most of these tumors show extrapancreatic invasion. For cases with multiple branched type IPMN lesions, combined resections such as lower head pancreatectomy + distal pancreatectomy (spleen-preserving) can be applied (Figures 1d, 2, &3). For inferior head resection, preoperative endoscopic pancreatic stenting is useful for the prevention of pancreatic duct injury as described. The stent is also useful for the prevention of pancreatic leakage after both resections. With this kind of combined resection, total pancreatectomy can be avoided, which is really less invasive for the patients. For cases with multiple branched types IPMN lesions, dorsal pancreatectomy can be applied (Figure 1e). If there are no lesions in the inferior head area, that portion can be preserved to avoid total pancreatectomy. The inferior head pancreatic duct branch is drained to the main pancreatic duct. This pancreatic duct system should not be injured during the procedure. Parenchyma-sparing pancreatectomy is mainly applied for benign pancreatic lesions. Assistance with pancreatic stenting and/or laparoscopy (24-26) is recommended in some cases to prevent complications. Recent advancements of surgical techniques have allowed us to perform several types of parenchyma-sparing pancreatic resection. Implication for health policy/practice/research/medical education: This article is recommended for surgeons, pancreatologists, gastroenterologists, and general practitionaers.